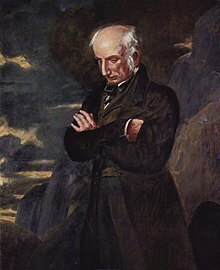 William Wordsworth (7 April 1770 – 23 April 1850) was an important poet of the Romantic Age in English literature. Many people think that The Prelude, an autobiographical poem of his early years is his masterpiece. Wordsworth was England's Poet Laureate from 1843 until his death in 1850. Wordsworth was born as second of five children in the Lake District. After the death of his mother in 1778, his father sent him to Hawkshead Grammar School. In 1783 his father, a lawyer and a solicitor, died. Although many aspects of his boyhood were positive, he remembered times of loneliness and anxiety. It took him many years, and much writing, to recover from the death of his parents. Wordsworth went to St John's College, Cambridge in 1787. Three years later, in 1790, he visited Revolutionary France and supported the Republican movement, although the Reign of Terror later made him change his mind. (see Prelude book 10) The following year, he graduated from Cambridge. In November 1791, Wordsworth returned to France and took a walking tour of Europe that included the Alps and Italy. He fell in love with a French woman, Annette Vallon, who in 1792 gave birth to their child, Caroline. Because he was poor and there were tensions between Britain and France, he returned alone to England the next year. But he supported Annette Vallon and his daughter as best he could in later life. War between France and Britain prevented him from seeing Annette and Caroline again for several years. It is likely that Wordsworth would have been depressed during the 1790s. In 1802 Wordsworth and his sister, Dorothy, visited Annette and Caroline in France. In 1793 Wordsworth published the poetry collections An Evening Walk and Descriptive Sketches. In 1795 he met Samuel Taylor Coleridge in Somerset. The two poets quickly developed a close friendship. In 1797, Wordsworth and his sister, Dorothy, moved to Somerset, just a few miles away from Coleridge's home in Nether Stowey. Together, Wordsworth and Coleridge produced Lyrical Ballads (1798), an important work in the English Romantic movement. The Preface to Lyrical Ballads is considered a central work of Romantic literary theory. In it, Wordsworth discusses what he sees as the elements of a new type of poetry, one based on the "real language of men" and which avoids the poetic diction of much eighteenth-century poetry. Here, Wordsworth also gives his famous definition of poetry as "the spontaneous overflow of powerful feelings from emotions recollected in tranquility." A fourth and final edition of Lyrical Ballads was published in 1805. He wrote a poem about daffodils and the Lake District. Wordsworth, Dorothy, and Coleridge then traveled to Germany in the autumn of 1798. The main effect on Wordsworth was that he became homesick. But he began to work on the important autobiographical piece The Prelude. He also wrote a number of famous poems, including "the Lucy poems." He and his sister moved back to England, now to Dove Cottage in Grasmere in the Lake District, and this time with the poet Robert Southey nearby. Wordsworth, Coleridge, and Southey came to be known as the "Lake Poets". Through this period, many of his poems speak of death, endurance, separation, and grief. In 1802 he married a childhood friend, Mary Hutchinson. Dorothy continued to live with the couple. In 1807, his Poems in Two Volumes were published, including "Ode: Intimations of Immortality from Recollections of Early Childhood". Two of his children, Thomas and Catherine, died in 1812. In 1813 his family, including Dorothy, moved to Rydal Mount, Ambleside , where he spent the rest of his life. M. H. Abrams, ed. (2000). The Norton Anthology of English Literature: Volume 2A, The Romantic Period (7th ed.). New York: W. W. Norton & Company, Inc. ISBN 0-393-97568-1. Stephen Gill, ed. (2000). William Wordsworth: The Major Works. New York: Oxford University Press, Inc. ISBN 0-19-284044-4. Wikimedia Commons has media related to William Wordsworth. This page was last changed on 26 February 2019, at 20:05.